1880 census of Little River, Montgomery County, NC, age 50, occupation Mill Wright. Buried in a cemetery in a cow pasture near Troy, NC. Property has changed hands several times. There is a fence around gravestones. From "...PATTERN OF TIMELESS MOMENTS..." Page 240. 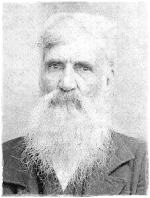 Alexander Patterson Leach, born May 1, 1830, lived at Forks of the Little River with his wife, May McLeod Leach, daughter of William McLeod and Elizabeth Jordan McLeod. "Sandy" Leach (as he was known) was recognized as a most industrious man, a good provider, and an asset to his community. He was by trade a farmer and bridge builder, having designed and erected the Smitherman Mill Bridge spanning Little River between Troy and Candor as well as a second bridge at Burney's Mill in Randolph in 1874. He also build the J.W. Steed home in Steeds which is still standing. He was Justice of the Peach and county commissioner, Clerk and Deacon of the Primitive Baptist Church at Suggs Creek for more than 50 years. On August 24, 1872 he was chosen Clerk of Abbot's Creek Association. Married at Mrs. Elizabeth McLeod's by William Coggins.